Greenville junior shortstop Morgan Gilbert drives a homerun over the leftfield fence in Tuesday night team practice. GREENVILLE – The Lady Wave high school softball team was on the diamonds Tuesday night at Stebbins Field, home of the Lady Wave going through a rigorous workout in preparation for Saturday’s opening day twin bill as the Lady Wave host the Wayne Lady Warriors and the West Liberty-Salem Lady Tigers. 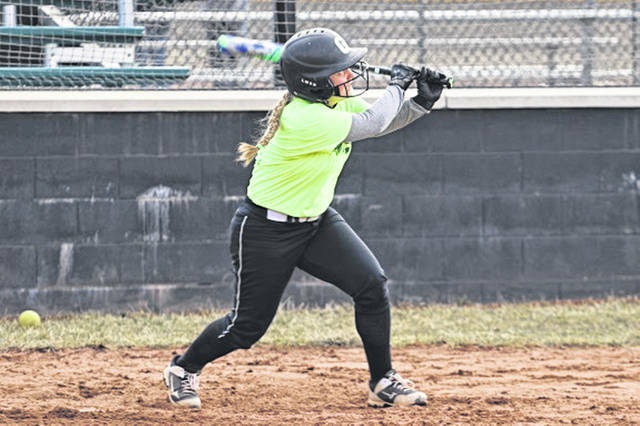 The 2019 Lady Wave opening day roster will be made up of one senior, nine juniors, four sophomores and 12 freshmen to play a schedule that includes 15 Greater Western Ohio Conference (GWOC) games and 12 non-league games. The new season will see the Lady Wave playing 13 games on their home field at Lady Wave Stadium, 14 games on the road including six games played at neutral sites. “Akron or bust,” concluded Coach Newland.